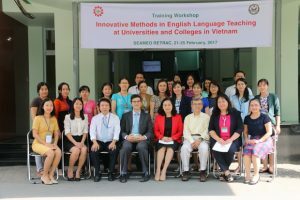 SEAMEO RETRAC in collaboration with Regional English Language Office (RELO) has successfully conducted two training workshops on Innovative Methods in English Language Teaching at universities and colleges in Vietnam for 56 lecturers of English in pedagogy from February 21st to 25th, 2017. The training workshops were delivered by Prof. Dr. Dilin Liu, Professor of Applied Linguistics, Department of English from University of Alabama, United States. 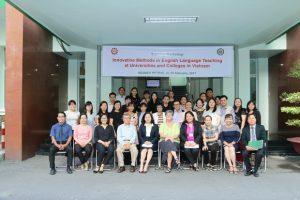 With great efforts from U.S. Consulate General in Ho Chi Minh City, Regional English Language Office (RELO) of U.S. Department of State and SEAMEO RETRAC organization team, participants have appreciated this offer and look forward to seeing such valuable trainings for future professional development.